And realised that I could issue commands and view objects. And I slowly came to realise that I could use this to help me test better. As a tester, I want to interact with applications, so I really want to learn how to test applications under the GUI and explore more conditions. So instead of having to click the ‘I want a slogan’ button in my “Evil Tester Sloganizer“, every time. I could instead generate 1000’s of slogans from the console and review them there. Or I could tweak the code slightly to generate 1000’s of instantiations of a specific single template. Very useful when testing something that randomly generates. You can try for yourself on the sloganizer, its pretty simple code, see if you can figure out how to generate a 1000 instantiations of one specific sentence. If I was testing the todomvc application then I would want to create a lot of data very easily, rather than having to create a whole bunch of Todo Items in this application manually, and slowly, I could write a small amount of code and create 100 in less than a second. Or 1000 in less than a second. Or really push the app and see how many it can cope with. But I should also be able to manipulate them – say toggle half of them. And I should be able to delete them as well. 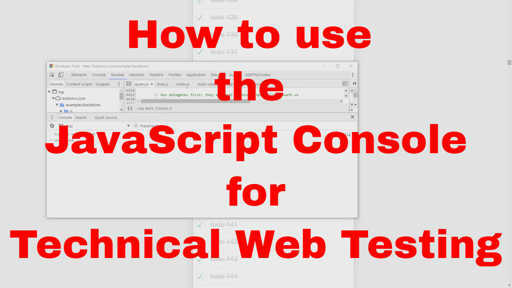 If you can do the above then you have implemented the CRUD (Create, Read, Update, Delete) functions needed to augment your interactive exploration and testing of the application, and you will now be able to test a whole bunch of new combinations and conditions that would have been harder to test. The console was a tool I hardly ever used in my testing. I primarily worked with web applications at the GUI, or the HTTP level. Using the console we can work under the GUI, without having to leave the browser and test at a new level with our application. You can watch this video on YouTube if you prefer. Blockchain is Here: Are Businesses Aware of the Challenges?